The economy of Australia is primarily based on agriculture . Over four hundred thousand of Australian populations are involved with agriculture or agriculture related jobs. Australia agriculture adds around 3% of Australian Gross Domestic Product or GDP. Australia agriculture contributed around 80% of export profit until 1950s, although this account has gone down in the recent years due to economic diversification. Australia agriculture comprises wide range of crops, horticulture, viticulture, dairy, fisheries and livestock. Australia agriculture follows fair trade strategies and is a member of agriculture exporting countries, Cairns Group. Agriculture industries in Australia receive very low subsidiary or support from the government, yet helps are extended during unusual circumstances like droughts, salinity or acidity of soils, etc. Primary agricultural products of Australia are used for both export and domestic consumption. Wheat and sugarcane are important cereals in terms of area and qualitative value to the economy of Australia. Besides, sunflower crop, oilseeds and grain legumes are extensively grown in Australia for human consumption or cattle feed. Australia produces several horticulture products like apples, oranges, tomatoes, mangoes, potatoes, bananas, carrots and chestnuts. Wine industry is also a flourishing agriculture in Australia specially the Chardonnay, Shiraz and Cabernet sauvignon varieties. 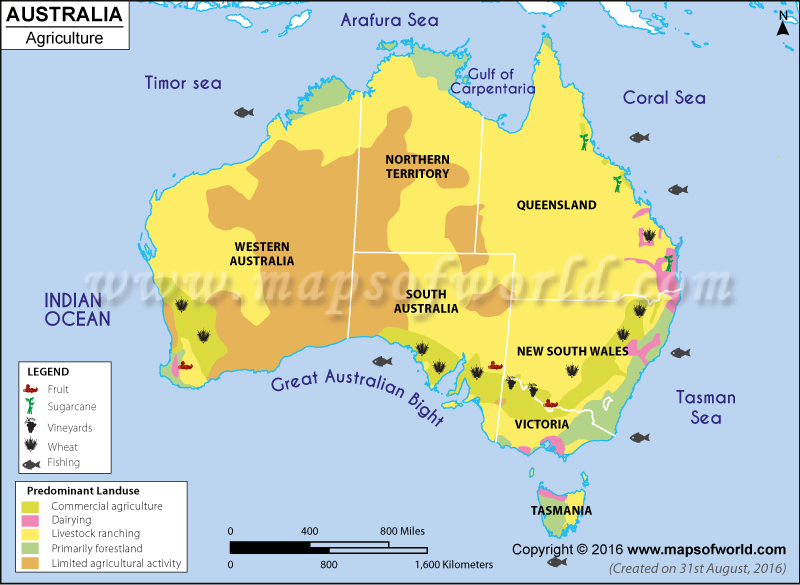 The rich pastures and favorable climate of Australia provides abundant supply of dairy products. Moreover Australia exports seafood like tuna, abalone, prawn and lobster. Australia agriculture suffers several challenging situations like drought, dryland salinity and acidity of soils. In spite of these challenges Australia is one of world's major exporters of agricultural products.